What better way to kick off the cool rides at the SEMA Show than with a classic hot rod from Pomona’s SO-CAL Speed Shop? This classic hot rod, staged front-and-left-center in Ford’s massive balcony display, runs one of Ford Racing’s wicked “Coyote” engines. Blown and fuel injected the nasty little 5-liter pumps out 625 HP through a 6 speed. 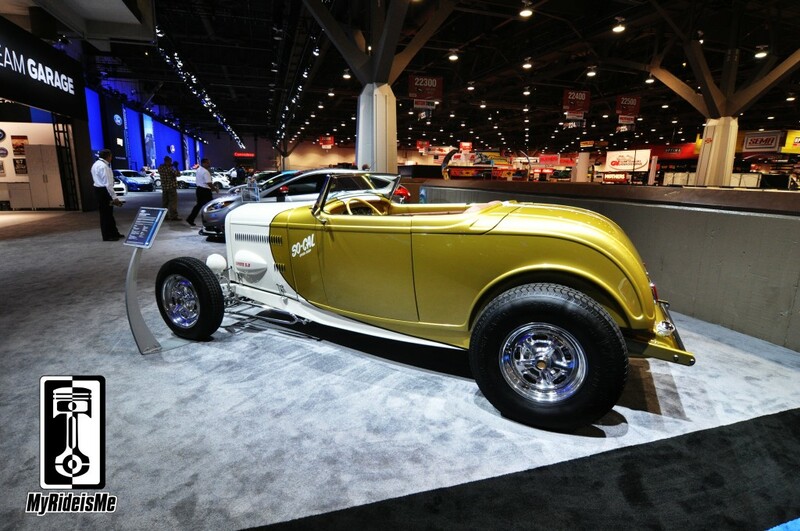 The 1932 Ford Roadster blends iconic hot rod with technology. The knockoff Halibrands riding on a SO-CAL “New Traditionalist” chassis lends that, “don’t mess” attitude backed up by the “one giant scallop” salt flat inspired paint job. Alternative Automotive Technologies in Troy, MI handled the paint and final assembly with build partners, Detroit Street Rods looking on. Champions Moto, a custom motorcycle company and fashion label also from Socal, rounded out the team. The technology comes from, of course that nasty Coyote under the hood, but also air conditioning for the hot and heated seats for when it’s not. The combination was good enough to win the Outstanding Achievement and Design Award from Ford Motor Company’s press conference. (Well it wasn’t going to be a Chevy pickup!) You can see the award peeking out in front of the seat below. Shelby Trim in Sterling Heights, MI stitched up the custom, ultra leather interior. Let’s ride! Parked in nearly the same spot at the 2010 SEMA Show, Troy Ladd from Hollywood Hot Rods showed his best Coyote work. It’s a tough act to follow, but this gold beauty pulled it off well! 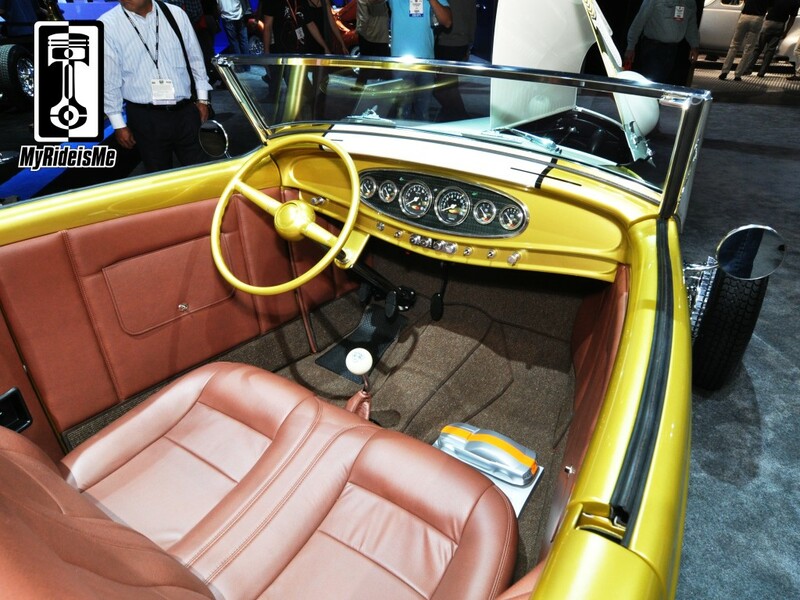 See more of the coolest custom cars from SEMA 2010 here. The SO-CAL 1932 Ford Roadster or?? 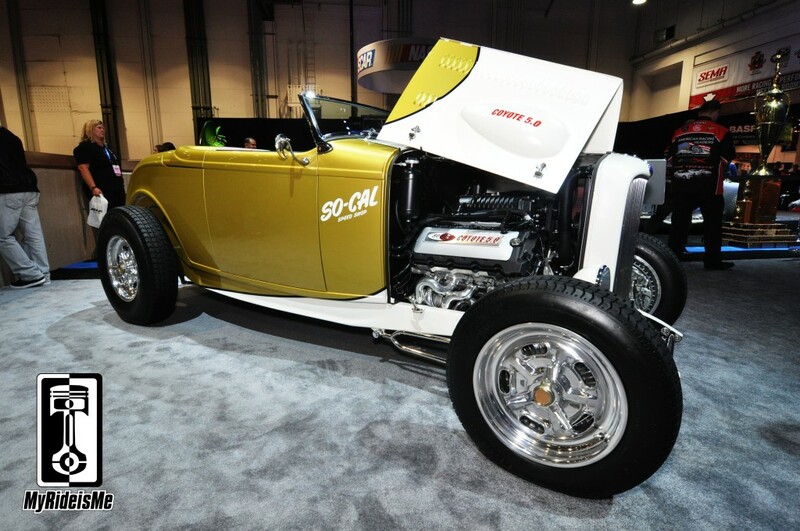 What was your favorite hot rod at SEMA?